Put your hands on your sides by your ribs so that you can feel your rib cage expand when you inhale. Left hand on the left side, right hand on the right side. Slow release: Here you can feel ribs stretch out when the breath is taken in and they slooooooowly move back in when your lungs deflate and you go back to being relaxed. The abdominal muscles will be engaged especially as you run out of air to help push any remaining air out. This is known as breath support. Put the palm of your hand about 4 inches in front of your mouth so that you can feel the air coming out. With a slow release the air should just hit the palm of your hand and nothing else. The air although slow, should still feel cold and be centrally located to the palm. Fast release: Here you can feel ribs stretch out when the breath is taken in and they quickly move back in as your lungs are emptied. This time, however, the abdominal muscles are engaged with a pretty strong force to push the air forward. Put the palm of your hand about 4 inches in front of your mouth so that you can feel the air coming out. With a quick release the air should be so strong that your whole hand feels cold. The air is still aimed toward the palm of your hand however with the force the air scatters and makes the whole hand cold. The difference between cold and warmer (but still slightly cold) air is the difference between pp and ff. It is the speed of the air that is different thus creating different dynamics. No movement in the shoulders. They shouldn’t raise move back, forward, or in any other direction. Clarinet playing involves DEEP BREATHING. Listen to the pitch of the breath. The higher the pitch (such as a gasp when one is surprised) the more shallow the breath. When taking the correct deep breath, the pitch should be lower as well. Breathing Gym—by using external motions with the hands and arms, the student is given a visual to better understand what the student is doing internally when taking in and releasing the breath. This is a very good book! This website describes clarinet breathing fantastically! Youtube has quite a few videos on breathing for clarinetists. Two wonderful sources are Michael Lowenstern and Sean Osborn. They’re terrific clarinetists as well! STEP 1. Sight-read the piece or etude. STEP 2. Once you are not more than 8 clicks slower than the final tempo, start figuring out where you are going to breathe. Beginning: here you have enough air to last you longer than any other section of the piece. Middle: By the middle of the page, even if you’ve taken a few breaths already, getting to the end is about endurance. If you’ve only had a few short breaths by the middle of the piece chances are you have stale air that you need to exhale before you take a fresh breath. Rests: Rests are ideal places to breath. If there is no place to breathe because you’re playing constant eighths or sixteenths, you can quickly slow down on the last two beats in a phrase before taking a breath. The result is a dramatic pause or if done in a subtle manner then it gives the listener a quick break from the intensity of the music before you jump back in. Using the above techniques will help you make it to the end. A big breath can be taken before the recap of a solo. Again, this follows the idea of phrasing. Before the last section, give yourself some time (not too much) to take a deep breath. You can use the same breaths that you used at the beginning in the recap. You may find yourself taking more breaths during the recap simply because you’re exhausted by the end. Step 3. Play at tempo. Play standing up, sitting down, and standing on a sturdy chair. Play at different times of the day. It takes a while to really get to know what you want to do with a piece of music. Putting yourself in different situations helps you build confidence in what you’re doing. We sometimes get rather emotional when we play. The less movement that one makes, the longer you can keep playing the phrases. When you move side to side or lean in or back you exert energy that takes away from your strength to sustain notes. Practicing ppp-ff while playing long tones helps to understand that the music is in the sound and not the visual. You can play a piece as long tones and take the same breaths that you would when playing it as written. In other words, instead of playing four measures of constant sixteenths, you can just hold the first sixteenth note for 16 beats at the same tempo. You’ll find that it’s less exhausting to do this. Bring the fingers closer to the clarinet if you need to and start to think about how much energy you’re using when you play the moving notes. The idea here is, you want to use as little energy as possible for the finger wiggling. You would be surprised at how much energy one can waste when you add the moving sixteenths back into the mix. As ridiculous as it may sound, for some it’s a given, don’t eat something heavy before you play. Remember that the diaphragm presses on the abdomen and pushes all your guts out. Not so comfortable after a delicious and heavy meal. Playing an instrument is very much like a sport. Be well rested and don’t eat heavy food and drink beverages with tons of sugar! 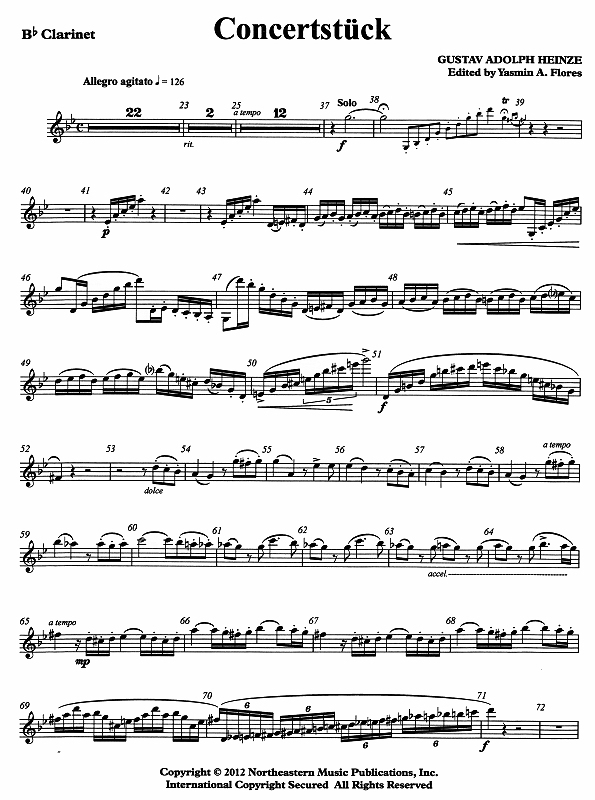 The idea behind the long tone exercises that are found on this site is that the first note is supposed to serve as a model for all of the other notes that the clarinetist slurs to. Don’t forget to check out a list of wonderful clarinetists whom I enjoy listening to under Clarinet Resources on this site. Dynamics—playing pp with the same intensity as you play ff. The breath support remains there at all dynamic levels. Getting to know your horn and the various resistances of notes and registers on your instrument is important to achieving a fluid sound. Different resistances of reeds. Have you ever picked a reed out of your reed case, forgot how soft it was, played it and became frightened at how loud it played? Having your reeds organized by least resistant to most resistant saves a lot of time and hassle in rehearsals! Your best tool in determining if your tone is what you want is a recording device. There are some recording devices out there that aren’t terribly expensive. Cell phones have yet to impress me with their recording ability. I would stick with something that has input for an external mic. Check youtube for videos of drones. Drones are basically long held notes. When you play the video, play your clarinet along with it and listen for “beats” or pulses in the sound. The closer you get to being in tune with the drone, the beats will slow down.